But manager Kevin Wilkin says the next five games will determine just how well Saints have started the campaign. 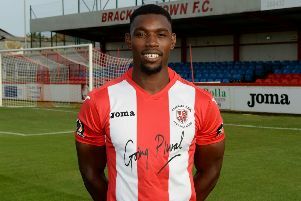 Goals from Lee Ndlovu and substitute Matt Lowe saw Saints beat Spennymoor Town 2-0 at St James Park on Saturday. Now Saints face two games in three days to try to remain in pole position, starting with Saturday’s trip to Chorley before they entertain Kidderminster Harriers on Bank Holiday Monday. Wilkin said: “It’s a great start, to win the first five games, but after the next five we will have a better idea of how well we’re doing. The players need to stay up to the mark we’ve set but we’ve got a lot of experience on the bench to change things. “Matt Lowe has done well every time he’s come on, so he’s pushing for a starting place. Two games over three days will be a test of the squad but everyone wants to be in the starting line-up.